Have you guys ever regretted one of your book reviews? I'm not talking about wondering if your gushing, lukewarm or downright bad feelings about a book were wrong because of all the glowing or scathing reviews out there that disagree with you. That's different: it's called impostor syndrome, and it's actually something I've covered before! I'm talking about looking back on old writing and wishing you'd expressed a point differently (or not at all), or learning more about a topic and recognizing the way you thought or felt about a book that dealt with it doesn't jive with how you think or feel now. While I still do think that there was a lot going on in Loving Day and that one of the story's main themes was how Warren changed over time, I still cringe at how dismissive and shallow that part of my review might sound, especially coming from a white reader. I've thought about going back to change that sentence, or perhaps even deleting it altogether. I mean, we've all made use of the "delete this Tweet" button, right? With reviews, though, I've always stopped myself. Even if it might save me (real or imagined) embarrassment, it would feel like I was erasing evidence of an instance in which I was less thoughtful with my words or judgment than I should have been. If I were going to change my review of any book, I'd want to go back to the book itself and reread it in its entirety or, at the very least, re-explore some of the passages or plot points that gave me the most pause the first time around. As voracious readers and prolific writers, I think book bloggers are constantly learning new things and reshaping their viewpoints in wake of them; what we posted a few months (or a few years!) ago might not represent what we think or feel now, but we shouldn't hurry to sweep our old words under the rug. Instead, we should bring them out in the open and explore why they might be inaccurate, troubling, or outdated. After all, the best way to prevent new mistakes is by acknowledging old ones, and that goes for much more than book blogging. 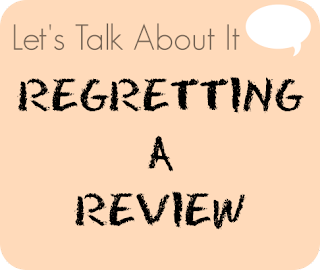 Have you ever regretted a review you've written, for whatever reason? I'd love to hear about it! I cringe going through my blog archives...it's like a nightmare. I haven't had too many situations where my overall viewpoint has changed, but I just feel like my writing has evolved and I hate going back to look. I agree that it's important to let it lie, though, as a path togrowth. Shaina you are amazing. This was a truly excellent post. I certainly have, maybe not regret, but like shudders when I read some of my earlier posts. What I read, and how I talk about it has changed quite a bit - in the only 6 months I've been blogging - but I think that growth is important to chronicle. I'll go back and change typos and things, but otherwise just try to let it go. Honestly I second guess myself every time my mouse pointed hovers over the 'publish' button. I wonder to myself, "Is that really what I want to say?" Some of the earlier posts I've written about are pretty terrible, and to be honest most of what I write now is gibberish. But while I might go back through and fix up some typos, I won't delete those terrible posts because it's fun to read back through them and laugh at myself and how silly I sound. Much cringing takes place. I think if my opinion of a book has been dramatically altered, I would definitely consider maybe doing a follow up post to discuss that, but I wouldn't delete the original. I wouldn't delete because in a personal sense it's good to have a record of how you have changed as a person; and in a blogging sense it's good for readers (of the blog and the book) to see that you're not afraid to say, "Hey, my thoughts on this have changed and this is why" - you might help others consider the book from a different perspective as well. Another great post! Yes, I've regretted a couple, mostly because I was less restrained in the past about my thoughts, more ranty, more over the top gushing, and I also missed subtleties where I wasn't familiar with analysis. But I don't delete either - I figure the date of the review is on the post and also, it's a learning curve. This is how I feel, too! Such a great post. I had a moment like this with my review of A Little Life after some discussion in the comments. Taking out the offending sentences would have felt dishonest, so I added a little (Edit: blah blah blah) thing after the passage I regretted. That way, I was able to address my problematic language without erasing it. When I was a baby book blogger I posted a very profane and shouty post about a book I didn't like, and the author saw it. And i just hadn't really had a sense of that ubiquity of the internet, where people can ALWAYS SEE IT if you're talking about them. I felt so, so guilty, and I still feel guilty looking back on it. I eventually deleted the post because it wasn't fair to the book -- I didn't even finish it -- and it made me much more thoughtful about writing negative reviews. Such a great topic and post. I've been blogging since 2007 and oh how I despise reading old posts. Part of my problem is that from 2007-2009 I was blogging on an old community site called Vox (that has since died) which was sort of like Livejournal, and most people posted several posts a day. So posts were much shorter and didn't require as much finesse. I've been slowly going through those very old posts, and taking down the ones that are just sort of pointless. I've seen a lot of old reviews in my archive gushing over books that I now feel a different way about, since I've evolved and changed as a reader. I'm keeping those live, if they pass the "not super short and pointless" test, because I have to accept and embrace who I was when I posted them.